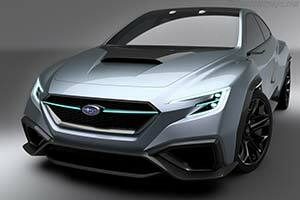 Subaru unveiled its VIZIV Performance Concept at the 45th Tokyo Motor Show. The VIZIV series of concepts embodies Subaru's vision for the future of making cars that deliver "Enjoyment and Peace of Mind." In anticipation of widespread future deployment of automated driving technologies, advanced driver assist functions, combining the next generation EyeSight system with other devices, are installed. The name VIZIV derives from "Vision for Innovation." The VIZIV Performance Concept draws inspiration from previous production models symbolizing the Subaru driving experience: the Legacy (Liberty in Australia), which defined Subaru as a driver's car, plus Impreza and WRX, which took the World Rally Championship by storm. Based on Subaru's "Dynamic X Solid" design philosophy, this next-generation sports sedan encapsulates driving enjoyment. Subaru has teamed advanced driver assist technologies scheduled for launch around 2020, with the high performance offered by the Boxer engine and Symmetrical AWD - creating a sports sedan symbolizing the "Enjoyment and Peace of Mind" expected of its cars.